After more than one year and half of depvelopment, finally they released Choqok 1.6. 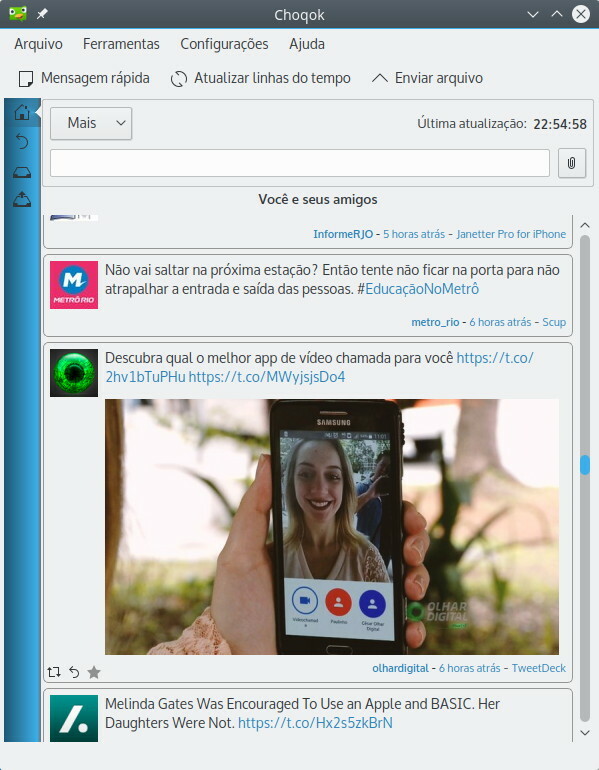 Choqok is a microblog client compatible with Twitter and other services. The official annoucement is at http://choqok.gnufolks.org/2016/10/choqok-1-6-released/ released last Sartuday. With the release, now it's time to package this version since I made them available for some time. I had just stopped when they started to migrate the software from KDE 4 to KDE Frameworks 5. Must packages, which this new Choqok depends, was not available for Debian and Ubuntu. Which made it difficult to create the packages. And I was very busy with another personal tasks so I gave up building. But, at this last weekend, I take courage and, with more time available, I started to view this version. It was necessary to review all dependencies. But one of them had to be recreated: qoauth. This Choqok version requires qoauth 2.0.1, which is compatible wit QT5 and no packages for Debian or Ubuntu are available. I had created a package last year but it was failed to build at Launchpad. Now,at this weekend, I applied some fixes and the package was sucessufully built. After this, I applied one more fixes and, finally, Choqok 1.6 is now available. The packages are available for Xenial and the future Yakkety versions of Ubuntu. I tried to build for Trusty but it breaks on this dependency. And I have no plans to backport libqca-qt5-2 for Trusty. For those who use Debian I would like to make some packages available but I don't have a place to keep a repository. But the sources are all compatible with sid and testing versions. The sources for Choqok and qoauth2 can be downloaded from the PPA and compiled on your machine. Remember to compile qoauth2 first since Choqok depends on it for building the package. Invalid plugin factory for "kf5/emoticonsthemes/kde"
I can't seem to find any missing library and I installed all the dependencies. Starts up fine for V1.5. I seem to have fixed it by installing libkf5emoticons-bin. V1.6 now starts up and works fine.